We now had a working grid tied solar electric system. But we didn't let it operate all the time. Why not? The salespersons for these solar installers usually claim that after installing their solar electric systems, your power meter could run backwards. This may be true of the old spinning-aluminum-disk type power meters. But it isn't true of the typical new digital readout power meters, at least the ones Progress Energy uses. The new standard digital meters can't tell which direction power flows. So you get billed for all the power that flows through the meter, whether you are consuming electricity or you are generating electricity and putting it back on the power grid. You need a special bidirectional meter installed which can detect which direction the power is flowing. How did we determine this? Normally, our house uses an average of 3 kW-hr of electricity a day. The installation of the grid tied portion of our system was finished around 11 AM in the morning. The inverter indicated that the PV (photovoltaic) system generated about 10 kW-hr of electricity for the rest of that first day of operation. Yet our power meter indicated that our consumption was about 11 kW-hr over the same period (about eight hours of sunlight). The only things running in our house during that time were the refrigerator, a clock, and a telephone answering machine (and the utility power meter, which consumes about the same as an answering machine; you didn't realize that the power meter draws power and you are paying for it, did you?). No lights, water heater, computer, modem, TV (we haven't had a working TV since 1982), oven clock, microwave oven clock and controls, doorbell (ours is powered by lithium batteries), heat pump controls, garage door opener controls, or any other "phantom" loads were running, which is typical in our house and one big reason our electric use is so low. So, from experience, our use over that eight hour period, one third of a day, should have been less than 1 kW-hr. The less than 1 kW-hr that the stuff in the house was using plus the 10 kW-hr generated by the solar system equals 11 kW-hr, which is what the power meter indicated. I have never seen any information from the power company warning that their typical meters can't tell which direction the power is flowing. Is this just another way "the man" is trying to screw the little guy? Not really. They probably wanted the cheapest power meter that met their needs to minimize their, and their customers', costs. At present, for at least 99.9 % of their customers, the power only flows one way, into the customer's house or business. As an electronics engineer, if I were given the assignment to design this power meter, none of the easiest and cheapest ways I can think of can determine which direction power flows. It takes a little more circuitry and cost to determine which direction the power is flowing. So the power company's meter choice makes good sense for them and the majority of their customers. So, until you get a new bidirectional power meter, that is, a meter that can record how much power is flowing in each direction, you will be billed for ALL the power that flows through the meter, whether consumed or generated. But the meter only measures the NET power flowing through it, that is, the difference between what is generated and what is consumed. 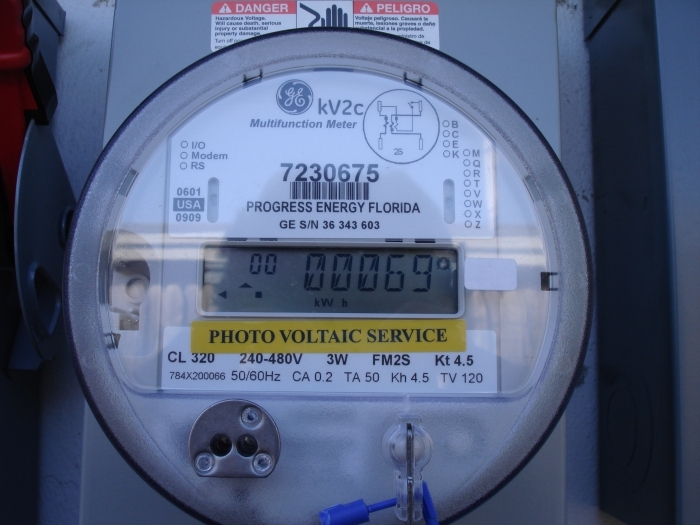 For example, if your PV system is generating 2 kW-hr and you are using 3 kW-hr, your meter will indicate 1 kW-hr has flowed through the meter. So, in this case, your PV system has saved you the cost of 2 kW-hr of electricity. But if your PV system is generating 3 kW-hr and you are using only 1 kW-hr, your meter will indicate 2 kW-hr has flowed through the meter and you will be billed for that 2 kW-hr, even though you generated it. So, if you are certain that you ALWAYS consume more power than you generate, you can leave your PV system running even with the standard power meter and it will save you money. But if you usually use less power than your PV system generates, then you are better off with your PV system shut down until you receive a new bidirectional power meter, unless you have battery backup and can run offline, that is, disconnected from the power grid. Consequently, until we had the battery back up portion of our PV system installed, we had our PV system turned off except during times when we were certain we were continuously consuming more power than our PV system was generating. An example of such a situation was when we were running our electric clothes dryer, which consumes about 5 kW-hr per hour of operation and typically runs 1.5 to 2 hr per load. Remember, our system has a peak power output of about 2 kW. Figure 1 shows what the bidirection power meter we finally received from Progress Energy looks like. To Progress Energy's credit, we received this new meter withing two days of dropping our application in the mail. Since I suspect virtually none of the power company's customers are aware that they are being billed for the electricity they generate while they still have the old power meter (I found no mention on the Internet of these power meters not being able to determine the direction of power flow), Progress Energy could have waited until the legal limit to replace the meter (in Florida, they have ten working days after they receive a valid application to replace the meter) and potentially collected a few extra dollars. But the goodwill and impression of being a "green" company by responding very promptly are far more valuable than those few extra bucks that they may have got by delaying swapping meters. This makes good business sense. As Figure 1 shows, the new bidirectional meter has two readouts. Though I have yet to receive an explanation from the power company on how to read the meter (probably with the next bill), reading it is fairly obvious. The smaller leftmost reading is the readout mode and the bigger rightmost readout is the total power in that mode. The readout switches between modes every couple seconds. When the mode is "00," the rightmost readout is the total net power drawn into the house. In this case, the meter shows that a net of 69 kW-hr has flowed into our house since the meter was installed. 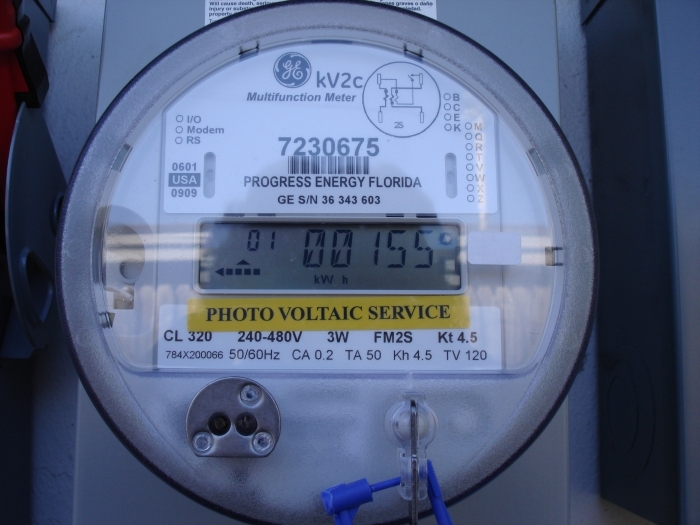 When the mode is "01," as shown in Figure 2, the rightmost reading indicates the total net power output from the house, which in this case is 155 kW-hr since the meter was installed. Incidentally, the meter was installed around 10:25 AM Feb. 3, 2010, and both pictures were taken around 9:48 AM Feb. 26, 2010. So, in this case, the meter indicates our house has generated over twice as much power as it has consumed. Figure 2 - New bidirectional power meter showing total net power that flowed out of our house. Why is this obvious? Well, for one thing, the rightmost reading in the "01" mode absolutely NEVER changes at night. It only changes during the day and in proportion to how sunny it is. In fact, the change in the "01" mode reading is always slightly less that the total power generated by my solar array, as indicated by my SB3000 inverter, unless I have some unusually heavy (for us) loads running that day, such as our clothes dryer (only once during this period) or our geothermal heat pump (only about four hours during this time period and always after sunset). Also, the "00" mode reading changes pretty much as our old power meter did whenever I turn on and off some unusually heavy load, such as the water heater. Note that these readings do not indicate the total power used and total power generated over this period, but only the NET power flowing through the meter during this time. The power meter can't tell what is happening inside the house. It can only measure what is flowing through it, which is the difference of what is used in the house and what is generated by the PV system. For example, if your PV system is generating 2 kW over a one hour period and you are using a constant 3 kW over that same period, the "00" reading will increase by 1 kW-hr over that one hour period and the "01" won't change. If your PV system is generating 3 kW over a one hour period and you are using only 2 kW over that same period, the "01" reading will increase by 1 kW-hr over that one hour period and the "00" won't change. This assumes the power used and generated is constant (not fluctuating too much) over these periods. So, over more than a day or two, both the "00" and "01" reading will almost always be less than what was actually consumed and generated, respectively, over that period, since some of that consumption and generation happened at the same time and canceled each other out before it was seen by the power meter. © 2003-2010 Stone Marmot Enterprises, all rights reserved.